The first weeping angel episode, Blink, is what convinced me that Doctor Who is indeed an excellent show. I have since been collecting bits of weeping angel-related craftiness, which I present here for your terror, er, pleasure. 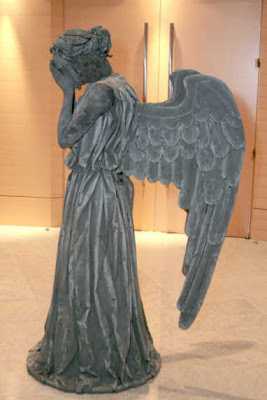 First, the angel everyone's probably seen before: the famed Barbie weeping angel statue. And finally, here we have the world's most fabulous (and thorough!) weeping angel costume. I love the attention to detail, not to mention the gratuitous Jewel Staite appearance. I love Doctor Who, Blink, and the Weeping Angel Barbie. Your blog never ceases to make me happy! Apart from how simply awesome that lady is for making that costume (totally ridiculous - I have zero creative ability like that so loads of respect! ), I can't believe she strangled Jewel Staite! Get This Cat a Letterman Jacket Stat!